In response to comments I have received, I have produced charts that show the average speed of operation on parts of the King route. This is at a very fine detail by contrast to the “link time” charts covering route segments that I published in earlier articles. The new material is added at the end of this article. 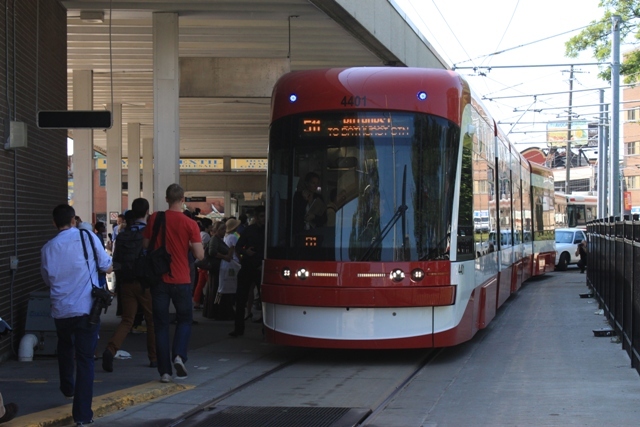 The TTC’s Andy Byford has proposed that King Street be reserved for transit vehicles during the AM peak period as a means of improving service quality. In previous articles I have examined service reliability and congestion, as well as the history of transit priority on King Street. The big issue whenever “congestion” comes up for discussion is that any tactics adopted to improve transit service need to address what is really happening on the street, not an abstract idea that somewhere, sometime, it might be a good idea to have some sort of transit priority. Previous analyses published here show the effects of congestion through charts of “link times” (the time taken by vehicles to travel of specific parts, or links, of a route), but these don’t pinpoint the exact locations or severity of delays. This article introduces a new type of chart that is intended to make delay locations and times much more obvious as a starting point for discussions of where priority is needed. Memo to Glen Murray & Karen Stintz: Are You Really Serious About Transit in Scarborough? With all the upheaval of transit plans for Scarborough, politicians fall over each other to tell Scarborough residents how downtrodden and ignored they have been, how they always get the short end of the transit stick. How will we fix this? Build them a subway! Mind you, that subway won’t open for 10 years, and riders on the Scarborough RT will have to endure more cold winters and overcrowded service, not to mention bus routes that run occasionally and unreliably. An LRT line from an underground station at Don Mills & Sheppard with a direct connection to the Sheppard subway running east to Morningside and beyond. An LRT line from Kennedy Station east and north via Eglinton, Kingston Road and Morningside to Sheppard serving the University of Toronto Scarborough Campus (UTSC). An upgraded and extended Scarborough RT using LRT to reach east and north to Malvern Centre. The Sheppard LRT is “funded” by Queen’s Park, but actual construction is a moving target with completion now planned for 2021. The Eglinton/Morningside line (aka “Scarborough-Malvern”) drifts in limbo not even a part of the Metrolinx “Next Wave” implying completion at best by the late 2020s. The Scarborough LRT has been replaced by the Scarborough Subway. Although Council attached many conditions to the financing for that line, you can bet that no politician in Toronto is willing to pull the plug, to return to the LRT scheme, with provincial and municipal election fortunes in play. One way or another, even by the simple expedient of giving Ottawa more time to pony up “their fair share” (whatever that means), the subway scheme will stay alive, and the Scarborough LRT will start to resemble Monty Python’s “dead parrot”. It will be “sleeping” only in the minds of its most ardent advocates. Politicians love to tell us how much they support better transit in Scarborough, and they could start by talking about something more than the subway. The TTC Board met on July 24, 2013, with a rather threadbare agenda. The most important item discussed — a proposal for a new Downtown Relief Line on GO corridors — wasn’t even on the agenda. It was walked in by Chair Karen Stintz, proposed as a report request and voted on with almost no debate near the end of the meeting. The TTC has announced that Pape Station will be shut down from Monday, August 19 to Friday, August 30. 72 Pape: northbound buses will operate to Broadview Station via Danforth Ave. On its return trip, it will travel north on Broadview Ave., east on Mortimer Ave., then south on Pape Ave. and back to route. 81 Thornciffe Park: buses will use Donlands Station, via Pape Ave. and Danforth Ave.
25 Don Mills: buses will operate to and from Donlands Station, via Donlands Ave.
Today the TTC took the media on a short excursion with its new streetcar, 4401, from Hillcrest Yard to Bathurst Station and return. I spent a good deal of the trip being interviewed by others, and so my photo coverage is limited. However, over on the Torontoist site, there are lots. Our journey was done at a leisurely pace. This was the first daylight voyage for one of the new cars, and it attracted a lot of attention. We seemed to arrive at Bathurst Station in almost no time, and this was in part due to the extremely smooth ride. I made a point of sitting directly above one of the trucks (the point of where the carbody has the least ability to move independently), and even going through special work, the vibration was not annoying. The curve into Bathurst Station from the north was more notable for the fun of seeing both ends of the five-section car at the same time (the turn is over 120 degrees) than for any sense of difficulty making the turn. Air conditioning was quite pleasant onboard, and the car maintained a comfortable temperature even with the doors open at Hillcrest Yard. The generously sized windows give a good view of the passing street, although it will remain until night operation to see just how much the tinted glass cuts external visibility. Daytime test runs will become more common now that the TTC knows the vehicles work and won’t be the source of massive service tie-ups. What I really look forward to is seeing and riding these cars in service. How will loading times be improved? Will the accessibility features work and be accepted as designed? How easily will passengers adapt to the new fare collection scheme as it gradually rolls out across the system? How long will it take for operators to drive these cars through Toronto streets with the same confidence and speed as they do with the CLRVs? Car 4400 is about to move to Ottawa for climate testing at the National Research Council. From there, it will return to Thunder Bay to be retrofitted with improvements developed during the test phase. 4401 and 4402 are still on the property, but they too will go back to Thunder Bay for retrofits. 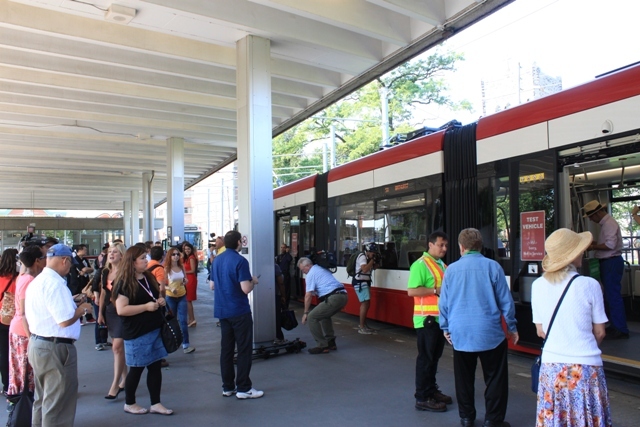 The TTC is holding off giving the green light to the production vehicle run to get the greatest benefit from the testing that remains, but shipments will begin in fall 2013 for a spring 2014 rollout. Sitting in the loop at Bathurst Station, there was (as operators of railfan charters would know it) a “brief photo stop”. The media went crazy of course with everyone getting in each other’s shot. No, there is nothing wrong with the destination sign. The LEDs in the sign are not all lit at once, but the image “scans”. We don’t see this effect (just as we don’t see flicker on a TV screen or computer monitor). It will be almost impossible, except with a long exposure, to get a picture of these cars with all of the text in the signs readable. A related issue is that during the daytime, glare on the side windows can make the signs above the doors difficult to read (in the photo below, the sign is in the shade). The transit industry solved the problem of brightly-lit signs a long time ago, and I don’t understand why the TTC has taken a step back here. More media at Bathurst Station with a few real customers mixed in. We managed to create a minor gap in the 511 Bathurst service. Updated July 23, 2013 at 2:50pm: TTC overhead crews finished their work earlier today and handed the intersection back to City of Toronto crews for reinstallation of the traffic signals. North-south streetcar service resumed on 504 King and 505 Dundas just before 2:00 pm, and the 506 Carlton service is expected to be back on its normal routing for the afternoon peak. As of 3:45 pm, the 506 Carlton route was off diversion. 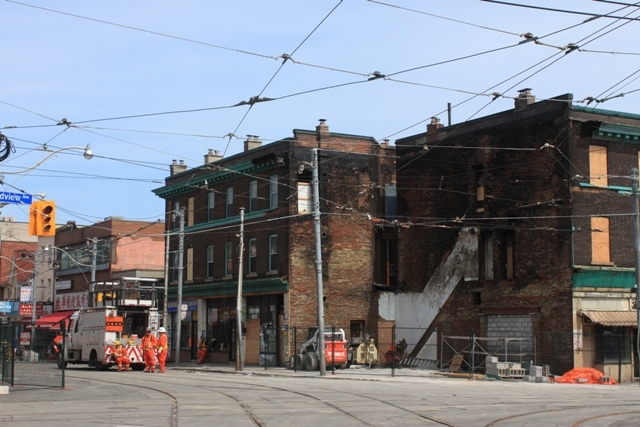 Updated July 21, 2013 at 6:15pm: The TTC has received clearance from the Ontario Fire Marshall and the City of Toronto to begin rebuilding the power distribution system and contact wire for streetcars. As mentioned in the note below, this will take several days, and regular service will not resume until late in the week. Many projects affect the development of Toronto’s waterfront and transit services. It is easy to lose track of how everything fits together, and this is an attempt to put updates for the various parts in one place. For an overall map of the waterfront, go to Waterfront Toronto’s site and click on “View Map”. Waterfront Toronto will hold a public meeting on Wednesday, July 24 from 6:00 to 9:00pm at the Toronto Fire Academy, 895 Eastern Ave (at Knox) with updates on the Don Mouth Naturalization and Port Lands Flood Protection, and the Lower Don Lands Master Plan. Ontario Minister of Transportation Glen Murray announced that Queen’s Park would fund 2/3 of the Scarborough Subway, an amount of $1.4-billion (2010$). This was described a cabinet decision taken in light of Toronto Council’s request for a subway to replace the Scarborough RT. Murray put the political ball firmly back with Mayor Rob Ford and called on him to fight together with Queen’s Park so that Toronto could get the remaining 1/3 share of funding from Ottawa in line with federal contributions to projects in other cities. With the press conference still in progress, TTC Chair Karen Stintz was demanding that the province pay $1.8-billion even though the lower amount has clearly been settled on by the government and isn’t likely to change. Yesterday, Rob Ford was widely quoted that if the full funding demanded by Toronto was not forthcoming, then the subway deal is dead. We will see just how dead the subway is, whether Ottawa can be brought to the table with bags of cash, and just how serious Toronto Council was that their subway approval was “contingent” on better funding than they will receive from Ontario. This will all be back for debate, without question, at the October 8 Council meeting. The debate about whether Toronto should undertake a Scarborough Subway in place of the proposed LRT line will occupy a good deal of Council’s time this week even though it is likely to wind up with a subway endorsement. We will hear a great deal of information, some of it true, some of it best described as creative fiction, and some just plain wrong. Expecting the gang of 45 to understand all of the details is a huge stretch, and this is complicated by a critical lack of information. Many questions have not been answered, nay have not even been asked. How Council can undertake a $1-billion or more project without being fully informed is baffling, especially for such a bunch of right-wing, penny-pinching fiscal conservatives. The times, however, demand a political statement, and we’re going to start by giving Scarborough a subway, no matter what it takes. In the midst of a major transit controversy, it is appropriate that this site has reached a new plateau of 30,000 published comments. That’s thanks to all of you who leave thoughts on a variety of topics (even the many schemes for routing future subway lines). The ratio of comments to articles is about 20:1, although some threads generate much more activity than others. As with transit vehicles, articles don’t arrive evenly spaced, and certain topics invite more crowding than others. Thanks for reading, and thanks for writing so much. The discussions are what makes this site work. Although my voice may be among the loudest (it is my site after all), it is not the only one heard, and the debate hones the issues for all of us.